Most Koreans prefer Chevrolet to Daewoo, the auto maker&#8217;s research shows. About half of Daewoo Lacetti Premiere customers are paying $200 to $400 to change the compact car&#8217;s badging to Chevrolet Cruze. The Daewoo brand will be replaced completely by the Chevrolet badge in Korea next month and a new corporate name, GM Korea Co., will replace the 8-year-old corporate label of GM Daewoo Auto & Technology Co. Ltd. The Chevrolet branding strategy was announced at a news conference in Seoul today by GMDAT President and CEO Michael Arcamone. “This leapfrog (rebranding) step for our company is designed to strengthen our commitment to the Korean market, recognizing it as one of the strongest performing countries we serve,” Arcamone tells Ward’s in an interview ahead of today’s announcement. He notes that while GMDAT has more than tripled global sales since General Motors Co. acquired the Korean auto maker and launched operations in 2002, domestic sales in Korea have remained relatively flat. Arcamone says the new corporate name legally should be in effect by the end of March. It was approved by the board of directors at a special meeting yesterday. Arcamone notes that on March 2, the Chevrolet badge will be put on all vehicles currently sold under the Daewoo nameplate, with the exception of the Damas and Labo commercial minivehicles. The Alpheon luxury car (the Korean version of the Buick LaCrosse) will remain in a class of its own, as it has been since its launch last year, and will not be rebadged as a Chevrolet. Cadillacs also will not be affected. Current versions of the Lacetti Premiere and Matiz Creative will be rebadged immediately as the Chevrolet Cruze and Spark, respectively. This year, the auto maker also will roll out eight new vehicles under the Chevrolet brand. In the first week in March, the Chevrolet Camaro, the all-new Orlando multipurpose vehicle and the Aveo (currently sold as the Daewoo Gentra) all will be launched in the Korean market. Several other new vehicles to bow under the Chevrolet brand will get new model names, which will not be disclosed until later in the year. They include the Chevrolet replacements for the current Daewoo Winstorm/Chevrolet Captiva compact cross/utility vehicle and the replacement for the Daewoo Tosca/Chevrolet Epica premium midsize sedan. The Chevrolet Corvette also will be introduced to the market. The names of the remaining two Chevrolet vehicles have not been released. One of them is an all-new, as yet unidentified model that is an addition to the portfolio and not a replacement for any existing vehicle. Arcamone notes the Chevrolet branding plan is much more aggressive than the multi-brand strategy he announced at the Busan Motor Show last April. “At the Busan Motor Show, I said we were taking a 3-pronged approach to our brand strategy in Korea. I said that we will have premium vehicles, the Alpheon and Cadillac, Daewoo vehicles and Chevrolet vehicles,” he says. “However, as our surveys and market research continued through the summer and early fall, it became increasingly apparent to me and my leadership team that we should launch Chevrolet as our primary brand in Korea. The market research and input from employees and other stakeholders overwhelmingly support this move. Research also indicates two out of every three GMDAT customers prefer the Chevrolet brand to Daewoo, Arcamone says. About half of Daewoo Lacetti Premiere customers are spending $200 to $400 to change the compact car's badging to Chevrolet Cruze, and roughly 38% of Matiz Creative minicar customers are paying to rebadge their cars as the Chevrolet Spark, he says. Dealers are enthusiastic about the switch from Daewoo to Chevrolet, as well. “We have discussed the name change with them and, according to a fourth-quarter 2010 survey, about 90% of our sales agents support the Chevrolet brand change,” Arcamone says. “This number is growing every day and, according to my domestic sales team, it’s probably closer to 95% today. The GMDAT workers union is receptive to the brand change and currently is working with management to design new employee jackets that will reflect the Chevrolet brand and the corporate name change, Arcamone says. Promotion of the Chevrolet brand in Korea will be an aggressive undertaking. “Our budget to launch and support Chevrolet's success in Korea is consistent with this revolutionary change,” he says, without revealing expenditure amounts. 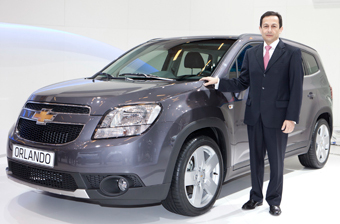 GMDAT also is phasing in the Chevrolet brand in Vietnam, which Arcamone says has helped trigger record sales there. The same holds true for GM Uzbekistan, where all models produced are badged as Chevrolets. There is a 2-year wait for Uzbek customers to take delivery on a Chevrolet Spark minicar. Over the past five years, GMDAT has spent some $10 million to “prop up” the Daewoo image and brand in Korea, a spokesman says. Those investments actually have been working against the company, because they perpetuate a name that fails to resonate with car buyers in Korea, he adds. GM Korea signage will be put in place quickly at each of the auto maker’s Korean facilities, the spokesman says. Ironically, one of the predecessor companies for GMDAT and the defunct Daewoo Motors actually was named General Motors Korea and referenced as GM Korea. That GM Korea came into being in 1971, when GM acquired the 50% stake held by Toyota Motor Corp. in Korea’s Shinjin Automobile Co. The name was changed to Daehan Motor Co. in 1976 when the Korea Development Bank (took over the Shinjin stake. The Daewoo Group acquired the Shinjin stake from KDB and changed the name of the joint venture to Daewoo Motors Co. Ltd. GM withdrew from the JV in 1992, selling its shares to the Daewoo Group. Ten years later, in 2002, GM completed acquisition of the major Korean assets of Daewoo Motors, which had gone into receivership in 2000. GM also acquired the Daewoo Motors sales network in Europe and renamed it Chevrolet Europe. GMDAT rebadged all Daewoo vehicles sold in Europe as Chevrolets. The move resulted in European sales tripling in just two years.